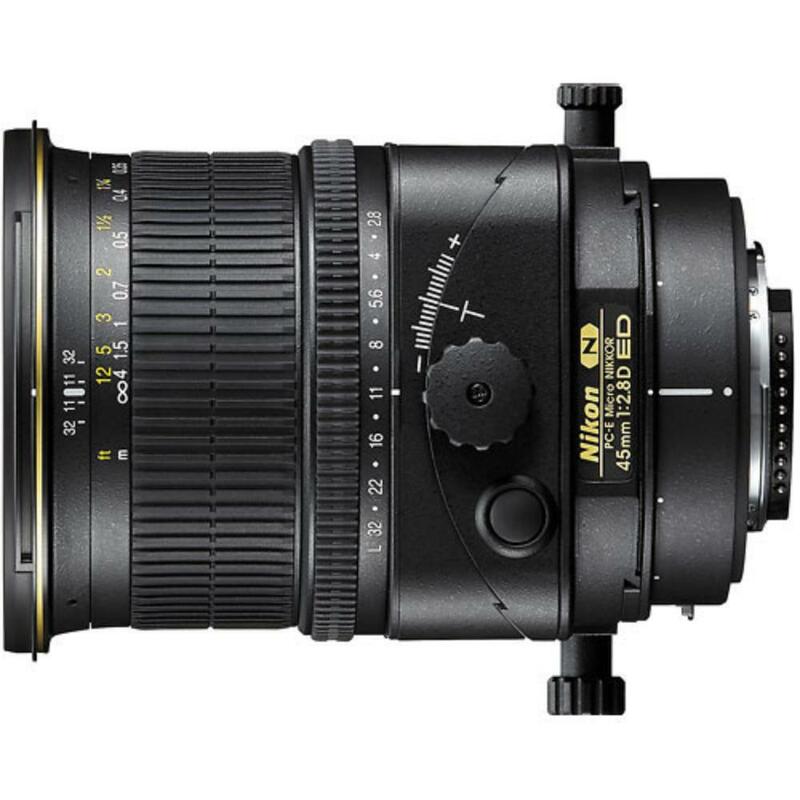 The Nikon 45mm f/2.8D ED PC-E Tilt-Shift is a special purpose lens that allows one to tilt and to shift the lens to mimic the movements of large format cameras for serious landscape, studio, tabletop, and architectural photography. The tilt-shift function on this 45mm f/2.8 lens allows adjustment of the focal plane by an angle of +/-8.5º and enables parallel shift of the optical axis by +/-11.5mm. Both tilt and shift can be engaged singly and in combination. The most common use of the shift function is to correct convergence while the tilt function is commonly associated with "miniature" appearing images. You can also use this lens without tilting or shifting as a "normal view" lens (but note that there is no autofocus function). Up to 90° of rotation in 30º increments left and right for setting which axis to have the shift and tilt set to and shift movements do not require locking or unlocking for use. Additionally, this lens sports a 1:2 magnification ratio. The Nikon 45mm f/2.8D ED PC-E Tilt-Shift Lens is ideal for fine art, street photography, commercial work, and architecture. • This lens is compatible with Nikon F mount cameras in both full frame and crop frame sensors. The focal length equivalent on crop frame sensors is 67.5mm. 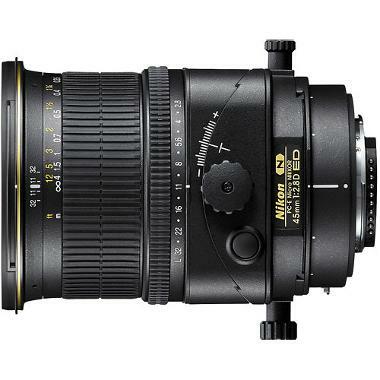 • This lens is NOT compatible with 2X and 1.4X Nikon teleconverters. • This is a tilt-shift lens and does not have any autofocus. This lens can be shot as a standard 45mm "normal view" lens or shifted in any angle desired and remain parallel to the sensor. Tilting allows you to tilt the lens instead of moving the lens around in a flat plane parallel to the sensor. Using tilt makes it so the focus plane of the lens is no longer parallel with the sensor. To see an example of shifting, refer to this post. To see an example of tilting, refer to this post.